Updated March 29th to version 2.3.5. This version supports Minecraft 1.7.10. New in this version, the Snow Queen rules over the Aurora Palace high atop the glacier, while trolls inhabit caves deep in the rock of the highlands. In addition to these new areas to explore, this version also revises the progression system to feature very visible weather effects in "locked" biomes, instead of less-visible magic effects. Version 2.3.4 adds a /tfprogress command to advance a player's progress, as well as hint monsters that may appear if you're struggling with the progression system. Version 2.3.5 fixes bugs, adds the knightmetal block-and-chain tool and adds a bit of new swamp scenery. If you haven't played one of the 2.0 versions, there is a new progression system. See the details on the wiki page. Support this mod on www.patreon.com/benimatic. Follow me on Twitter: @benimatic. Download v1.8.1 - client files for Minecraft 1.2.5. Requires Minecraft Forge. Uploaded 4/19/12 Updated 4/22 - fixed a few stray pixels on the items and armors. Download v0.1p4 -updated 08/22 - for Minecraft 1.7.3. Note that saves from previous updates are not fully compatible so you will have to start a new game. Download server mod 0.1p4 - for Minecraft 1.7.3. Only needed if you are running an SMP server. To install, drop files into the minecraft_server.jar. Note that it replaces the normal world, so you will need to generate a new world to use this. View the change log on the wiki. View the FAQ on the wiki. View the installation instructions on the wiki. 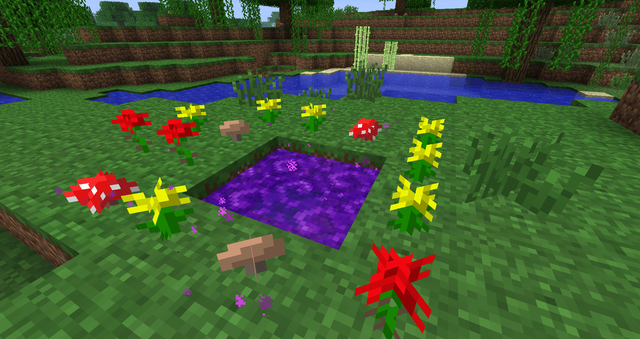 To make a portal to the Twilight Forest, make a 2 x 2 shallow pool (4 squares) of water in a grassy area, and surround it entirely with natural stuff. Flowers, mushrooms or tall grass. Then throw a diamond in (with the "Q" key, by default) and stand back! Loooks has a great video showing some scenes from the mod here. Very tranquil. Lots more videos in this spoiler tag here! Some installation guides and some more mod showcases. Paulsoaresjr takes on the Twilight Forest in his Man vs. Minecraft series. Episode 1 below, but check out the whole series. Loooks has a great video spotlighting some of the new features here. Very tranquil. Minecraftmoe shows you some views of the Twilight Forest with some epic music. GeraldoCockerhan fights the naga and wins! Please note that I don't usually have the time to respond to mod pack requests (or private messages in general). The Twilight Forest is fully supported in the Zekocraft texture pack. I love it! Also there's the strange and wonderful Ruinex texture pack has textures for this mod. Please let me know about other texture packs. Seems cool enough. I'll check it sometime. I had an idea like this, however this is much better! I don't suppose your taking suggestions, by any chance? I can also make skins... although they're not that good. This has nothing to do with twilight the movie. Sounds like an EXCELLENT Mod off for a good start, will keep following you on this. Good, creative ideas, a good atmosphere, etc. Just imagining what could be done with this :smile.gif: Congratulations and thanks! That's definitely interesting. I'll have to take a look; even if it is quite unfinished the generator is decent right now. What are your plans for ores or other valuable materials? Looks cool so far! With all the torches on the trees, getting lost is going to be an issue for those of us that look for our lighted paths on the way back to shelter. Giant fireflies are going to be such an awesome mob! Awsome! Great to see this has a release! When I try to run this mod, my Minecraft crashes and I get this error report. Hey, "twilight" is a word beyond the crappy books/movies. Look it up. Anyhow, this is looking fantastic. I've been waiting for a randomly generated world of epic nature! Thanks for this!